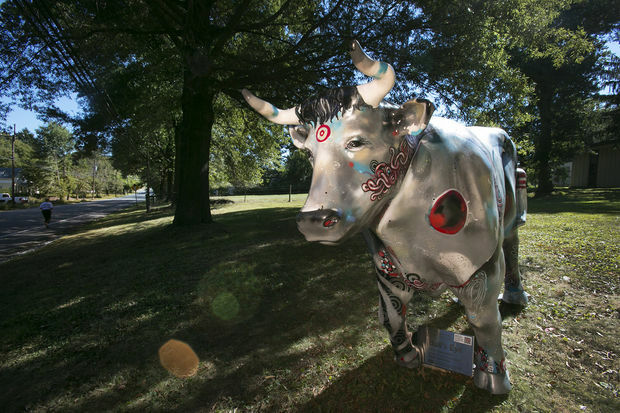 The “stampede” of 68 colorful and artsy oxen that have taken over a New Jersey community will soon be running out of town, but not before fans are given a chance to give the fiberglass beasts new homes. The Hopewell Valley Arts Council’s first big project has attracted people from around New Jersey and beyond, said Carol Lipson, co-chair of the project. The response was bigger than expected. “It’s been more positive than even we could have thought,” Lipson said. The oxen have been stationed along roads and at farmstands, parks, farms and commercial plazas. One was even placed on a trail up Baldpate Mountain. Some have flowery designs, while others tap into the character of the area, such as one painted with the famous rendition of George Washington’s crossing of the Delaware River. The oxen arrived, blank of any design, in March and were embellished by artists and organizations from the community. The herd is on the way out of town, however, as the arts council auctions them off. The group is now taking live bids on 33 of the oxen off in an online auction, which is open to anybody interested in the life-size bovine, Lipson said. The auction is open until Oct. 19 at 3 p.m., after which the arts council will hold a ceremony with live music and food trucks at Hopewell Elementary School, Lipson said. Ten more of the oxen will be up for bid at a gala in January where they will be auctioned off. The remaining oxen were pre-purchased by businesses in the area, she said. The project was intended to both raise awareness of art in the area and provide a fundraising mechanism for future arts council projects, the council has said. An interactive map below, courtesy of the arts council, shows the locations of the different oxen, where they will remain stationed through next weekend.